Besides, you will also learn how to determine whether the column should be designed for axial force or axial force with uniaxial bending or axial force with biaxial bending. Axial Load – It stands for a force that is functioning to the centroid of a specific section and perpendicular to the plane of section. Concentric Load – When the axial force is functioning via the centroid of the member. Eccentric Load – When the axial does not function via the centroid of the member. Because of eccentricity, a moment will be created in any one axis of the column. Uniaxial Bending – Here, bending occurs in any one axis of the column i.e. either in the major axis or in the minor axis. Biaxial Bending – Here, bending occurs in both axis of the column. 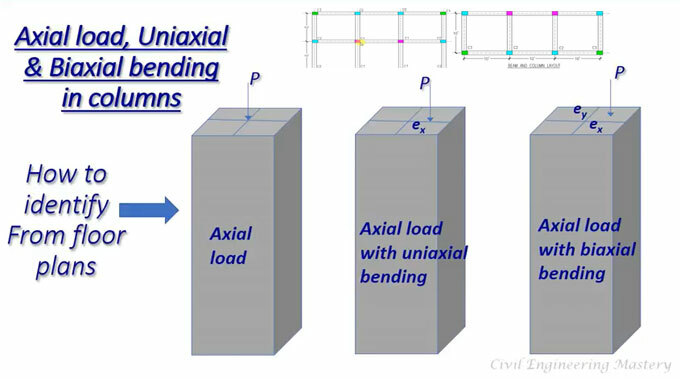 In uniaxial bending, the load is eccentric about only one axis but in biaxial bending the load is eccentric about both the axis.